Corte estilo "fade" | Wahl EE. UU. Moisten the hair with water and comb through it. 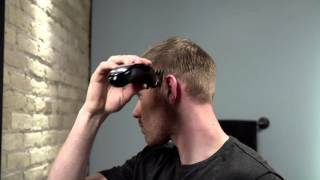 Using your Wahl clipper, attach the number 2 guide comb and then begin around the ears, moving towards the back of the head, using an upward, rocking motion. To get a tighter taper around the ears, pull the skin taut while cutting. Once you’ve taken care of the sides and back, put on the number 4 guide comb and focus on the top of the head, using a front-to-back, rocking motion as you move the clipper across the top of the head. Detailing makes all the difference with the Fade. Use the rocking motion or inverted clipper technique. And when it comes to the cowlick, make sure you cut in the opposite direction of the growth. The Fade is a polished look but some still like to add styling product at the end to finish it off. Having the right tool for the job can make all the difference when it comes to at-home haircutting. Using the Upward Rocking Motion is sometimes the best way to blend different lengths of hair in different sections of the head to achieve a finished look. To do this, carefully pull the clipper away from the scalp in fluid strokes as you cut upward to blend the hair from one length to the next. With fine hair, you will need to do more blending because it tends to show different cut lengths more easily.